Perfect weight for Texas summers! Update your space with the Mona Comforter Set for a Bohemian look. This unique pattern features floral medallions and bird motifs in a mirror layout with bright shades of yellow, orange and teal for a beautiful update to your space. Two decorative pillows use coordinating colors to pull this look together. Bought this for my bedroom...LOVE IT!! So colorful I can put so many different sheets, curtains and pillows with it. Brightens up my boring room. Bought 2 of these in twin size for my teenage and preteen daughters who share a room. We all love it! They are lightweight and soft. After a year of having them they have held up so well. Love how vibrant they are. The price was amazing! I ordered this in a twin size. The colors are fresh and vibrant. The small yellow pillow was a bit cheap, but other pillow is great. I bought a sea blue linen pillow for a nearby white chair (not using cheap yellow pilliw) For the money, it is a nice set. I shopped around a lot before deciding on this comforter set. I am so glad I bought this one, it is perfect for my guest room. It fits my twin storage bed really well, and the colors brighten up the room considerably. Love the detail work on the pillows, and the comforter is very soft and warm. Extremely pleased with my purchase, could not ask for a nicer set! Thanks, Overstock! It is very light weight, but the colors are pretty. I would definitely recommend this to a friend. The bright colors make me happy and I bought colorful sheets to match. It makes me want to crawl back into bed every time I walk in and out of my bedroom. And my elephant pillow looks so cute as a throw pillow the bed. This comforter set makes my room bright. Looks just as pictured. LOVE how soft and warm this comforter is! The quality is great and the colors are beautiful! Pretty but really poor quality, truly a case of "you get what you pay for". The decorative pillows were a nice little bonus but I would rather have skipped the pillows in exchange for a better quality comforter and shams. I love this comforter, -- it's so cute! I didn't realize it came with the throw pillows, which was a really nice surprise. The colors are pretty much just like the photo and the shade of yellow is really nice and cheerful. It's really comfy and puffy as well. My only problem with it is that it's kind of too hot for me and I'm usually cold, so if you get hot when you sleep this may not be for you. Love it! The colors are warm and vibrant. My daughter picked it out for her dorm room. She is very excited. Beautiful and vibrant colored bed set! Just as promoted; great colors and quality! This set is so beautiful! The colors are stunning! I love it! Very pretty, have washed well for the past 6 months, almost each weekend (for a BnB), including the comforter. The colors and design are beautiful in person. The size seemed to be generous. It is a great comforter for a great price. I don’t give it 5 stars because the fabric is not the greatest. The pillows seem a bit cheap and thin fabric. The comforter is a mix of satin and cotton, kinda silky feeling. I prefer a softer more plush fabric. I am happy with it for my 13 yr olds room. I bought this for my adult granddaughter for Christmas. She hasn't seen it yet but I know she will love it. The colors are perfect and her favorites. When I got it I was pleasantly surprised to find it was even nicer than I anticipated. Love this lightweight comforter set. The colors are nice and bright. I had to wash it shortly after I got it. It washed up great in my front load washer. "Can you recommend an area rug to go with this comforter. Size 5 x 7 or something similar in size?" "How many pillow cases does this comforter come with?" Two. Same pattern as the comforter. Flowers on front, yellow on back. The fabric is very thin and almost satin like. Not sure if that's your thing or not... I personally wish I got the coverlet version of this. "Is this available in queen size?" "Is the background bright white or off white?" It is bright white. The colors are vibrant and it's really pretty. 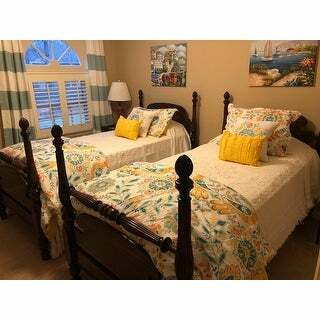 vibrant colors for guest room and good price. Hope the colors are as shown...especially the yellows. "Is the color on the comforter grey?" Yes. There is some grey in the design. The background color is white. The background color is white. The pattern colors are orange, yellow, grey, light green and teal blue. There is no red in the design. It is a floral with flowers, leaves and vines, with some birds. I bought this for a twin bed, in my guest room. It is very large, so would be fine for a XL twin bed, in my opinion. It is very nice fabric, and it made my room look so much brighter. I have a cabin bed with a bookcase headboard, and it looks great. Well worth the money. "I'm referring to the Intelligent Design Mona Comforter Set. Is the colors orange or red?" When I look at the orange on my comforter, I would say it's a bit of a dark orange, almost with a hint of rust. Definitely not red.